In order to explain the diet to you, I must first tell a little of the story of BrightHaven. In the beginning I worked for a wonderful veterinarian, Dr. Doug Coward of Mission Viejo, CA, who helped me enormously by employing the wonders of modern medicine to treat my animals. 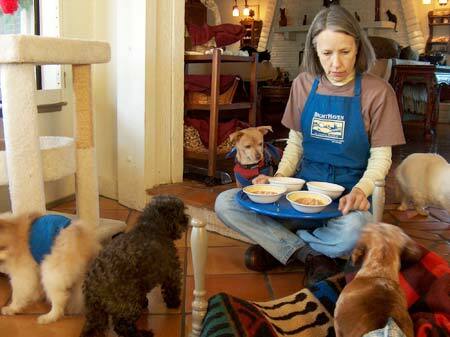 I was feeding them a veterinarian-recommended food and felt that I was doing the very best possible. In those days, BrightHaven took in animals over the age of 16 years and occasionally some who were younger and seriously ill or tremendously handicapped. Over time, my confusion mounted when our animals continued to die, although given the very best conventional care. After the loss of a precious Siamese that had stolen my heart, I agreed to listen and to try the natural way, both in diet and medicine, and WOW did things change at our house! We started to see shining fur and gleaming eyes and so much more energy—and this from cats in their 20s! For those of you who are still a little skeptical (as I was! ), it helps to remember that cats and dogs are carnivores and have flesh-tearing teeth. Since living in the wild their natural diet would be mice, rats and other small rodents, thus at BrightHaven we feed primarily raw meat balanced with a small amount of vegetables, which they would ingest from their prey’s stomach, if eaten. Pet food is an 11 billion dollar a year industry in the US alone. Many pet food manufacturers take the waste products from the human food industry and turn them into profit. Most brands, from supermarket foods to so-called premium pet foods, use inferior if not downright disgusting ingredients as well as artificial flavorings, colorings, preservatives and other chemicals which have been proven to have harmful effects on the health of our companions. A lot of nutrients are destroyed during processing of these foods and claims of 100% complete and balanced nutrition aren’t more than wishful thinking. Dry foods are particularly damaging since they are heavily grain-based; true carnivores such as cats have no use for carbohydrates, which in excess can lead to obesity or diabetes. The low moisture content can also dehydrate animals. Cats that are fed dry kibble commonly suffer from urinary tract and kidney problems because they never drink enough to make up for the lack of moisture in dry food. If you insist on feeding commercial food, please choose more “natural” brands that use high quality meats and no artificial additives. Dry kibble is best avoided altogether. A natural, raw meat diet, supplemented with vitamins, minerals and essential fatty acids resembles most closely what cats and dogs would eat in the wild—and the closer you stick to nature the better. Good health starts with a good diet and you will notice the overall appearance of your animal improve dramatically once you start them on natural food. You will also have the satisfaction of knowing what exactly you put into your animal’s mouth. Though it may be more expensive to feed a natural diet than to buy dry food from a supermarket, you will probably save a lot of money in vet bills due to improved overall health. Feeding a raw meat diet actually works out more economically than feeding a high quality canned food! 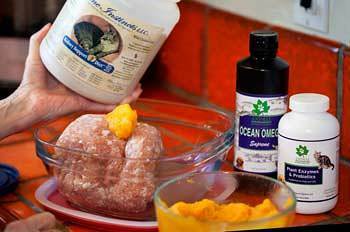 For more than 20 years, we have fed the BrightHaven Diet, which is simple, quick and very easy. Please consult with your vet before making any changes to your animal’s healthcare regimen. You can visit our Corporate Sponsors page for additional information about the products we use. Just like Feline Instincts, Animal Essentials has also very generously donated their products to BrightHaven for over 20 years.